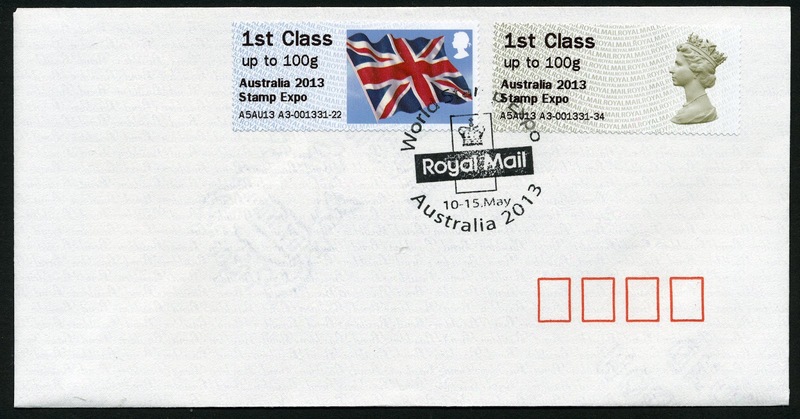 After 10 months, how many Machin stamps so far this year? Write your guess down before you read further! It isn't a competition, only with yourself. 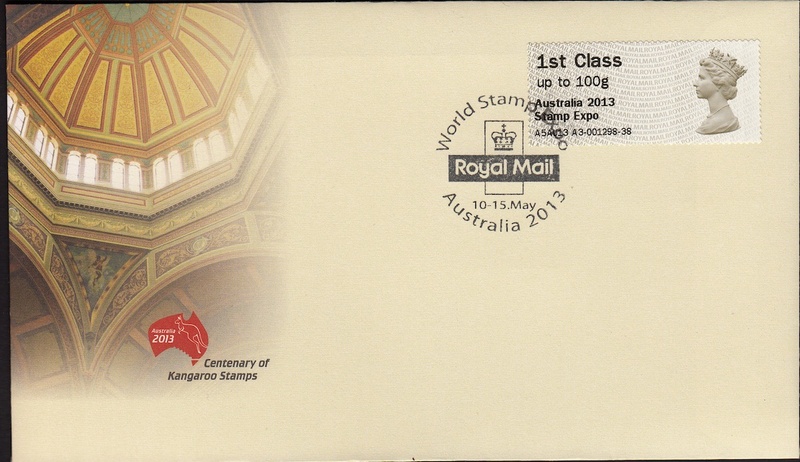 So.... in January the 1st class stamp turned red, but had 2012 codes because they were contracted last year. Some 2013 reprints have appeared. 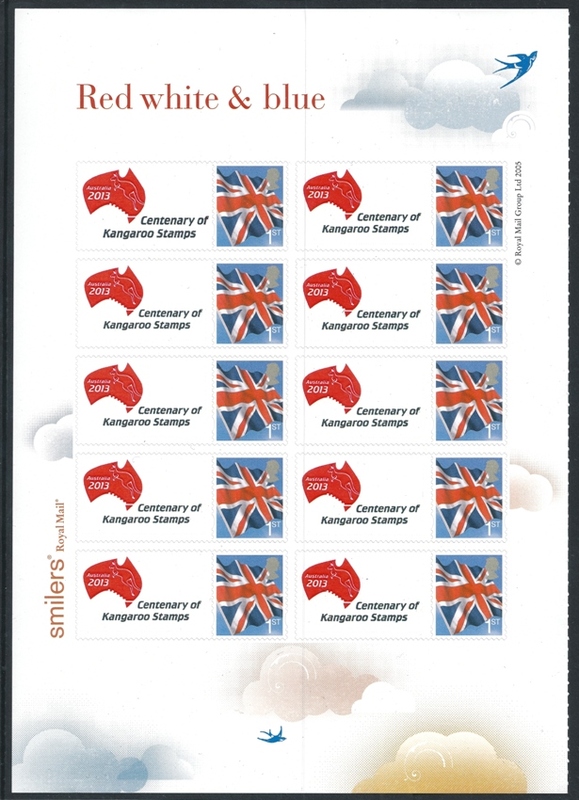 Then there were new postage rates, with 3 of the 5 stamps printed by two printers, and some rates were unchanged and the relevant stamps have also been reprinted. 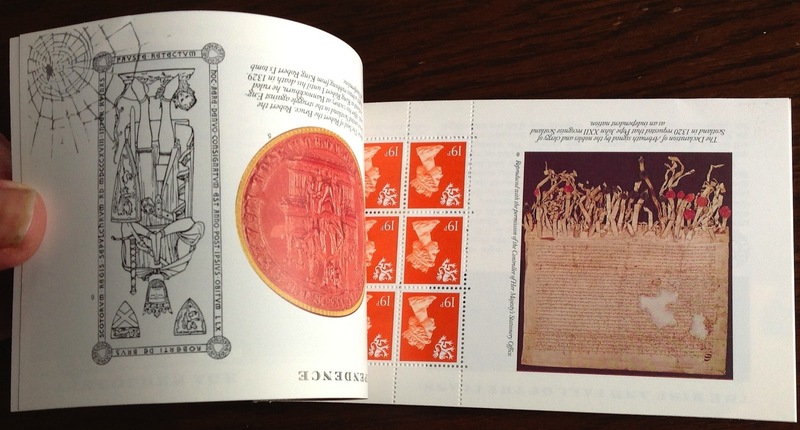 And we've had three prestige stamp books with Machin definitives in. I've been a bit slack in keeping this updated, so additions in blue are since the last update. 27. 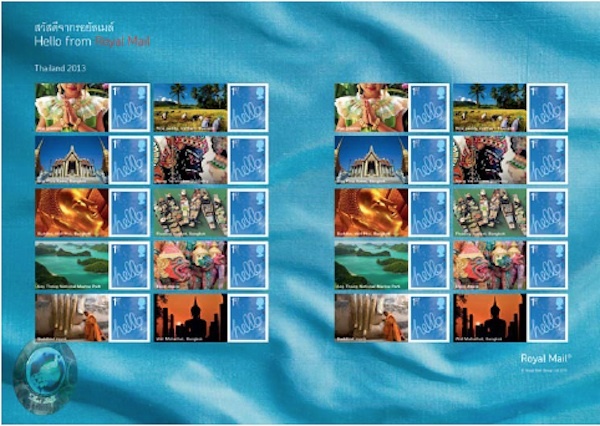 78p new postage rates De La Rue printing MA13 (* only in presentation packs and FDCs) - now available in sheets. 88p and £1.88p available by De La Rue with printing date and sheet numbers. 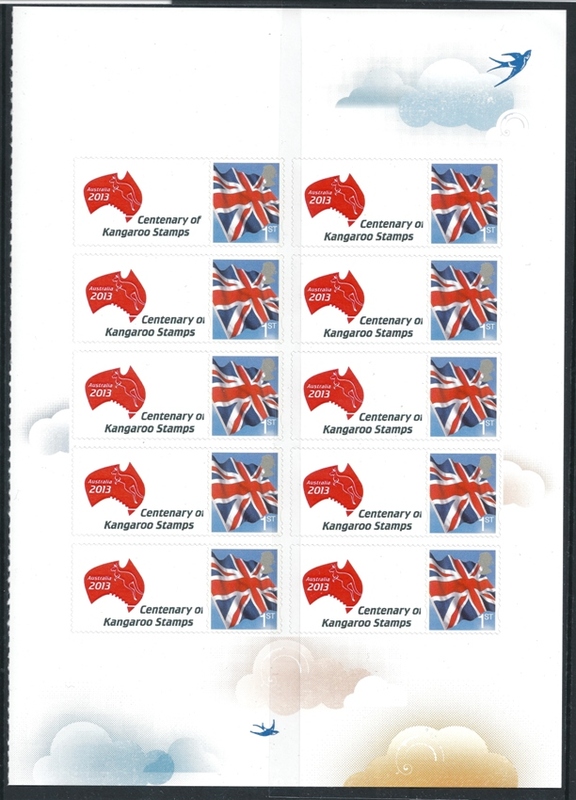 Now 54 Machin definitives this year! How close was your guess? And maybe the first 2014 PSB (at Spring Stampex) will have 2013 year codes? 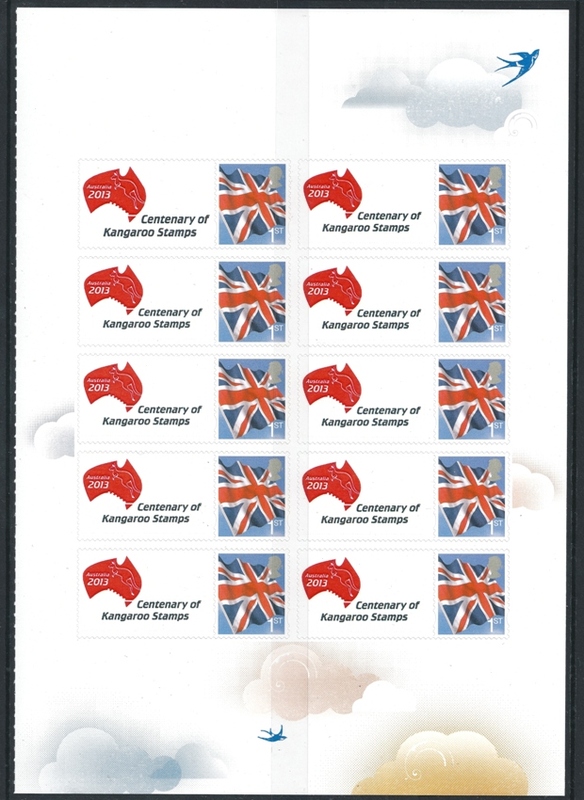 Flag Faststamp re-used from 21 or 27 May for Coronation anniversary. 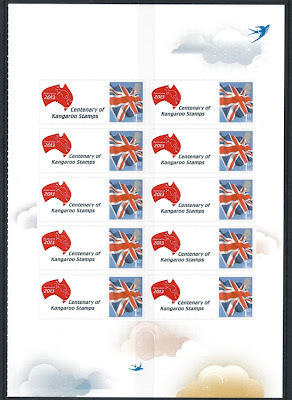 However, this is not a re-issue with an overprint, it is simply a re-use of the Union Flag stamp to coincide with the Coronation anniversary. But - and there always seems to be a 'but' - there is some confusion over the dates. 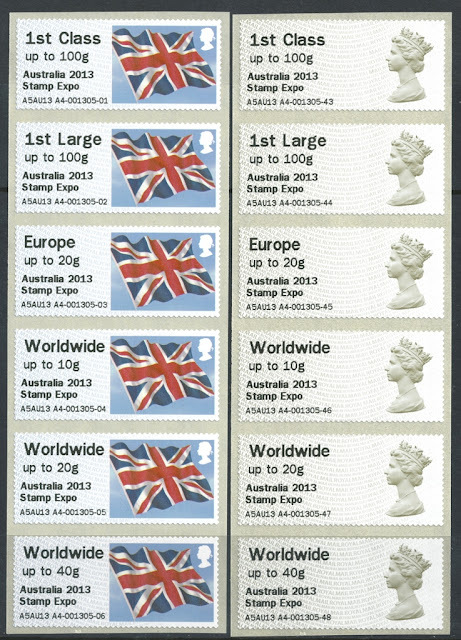 On Tuesday 21 May you will need to change the stamps in your Post and Go machine to the “Union Flag” Post and Go stamps. These are being re-released as part of the Queen’s Coronation Celebrations in June. They should be used in your Post and Go machines until June 25th when the next set of Pond life (Lakes) series will be issued. 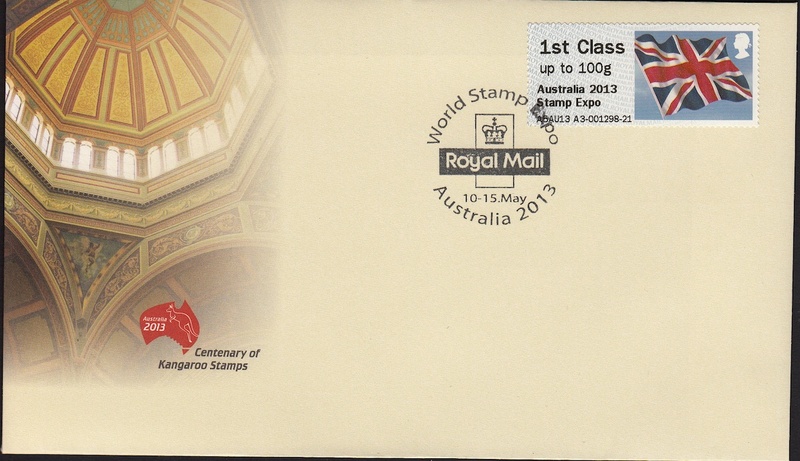 As this is not a new stamp, no First Day Cover envelopes, First Day Postmarking facilities or Stamp Packs have been issued. So, if you visit Post and Go offices you ought to find the Flag already in use - indeed some offices with many machines may have had the Flag in continuous use alongside the Machin head and Freshwater Life stamps. 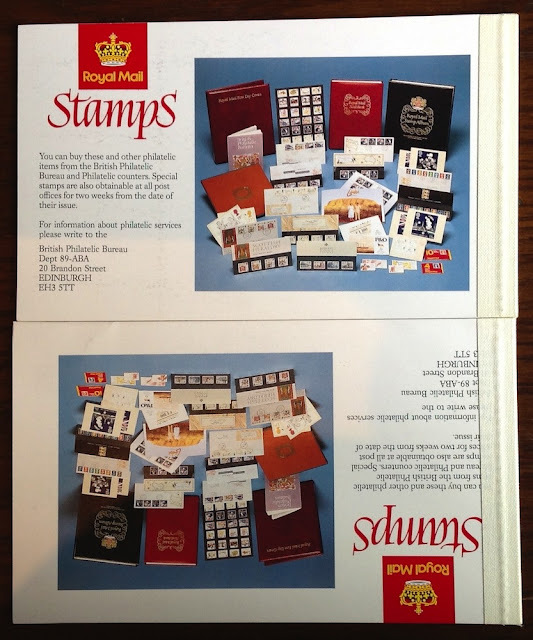 There were no starting new discoveries of modern stamps at Sunday's meeting of the Modern British Philatelic Circle, but a couple of members had some interesting Prestige Stamp Book errors to show. My thanks to Vince P for using his iPad to produce much better images than I could have done with my phone! From 1986, the Steel Wheel British Rail booklet. Here's the back cover, with the normal for comparison. So in fact, only the front cover was differently aligned. This provides us with an explanation of how this could happen. Remembering that each page was printed in a sheet of something like 12 or 16, assembly would require all the original sheets, from back cover to front cover, to be stacked prior to stitching. Stitching down the left edges of the front cover would probably then take place in the sheet, before the sheets were guillotined into individual books, and the binding material stuck over the stitching. 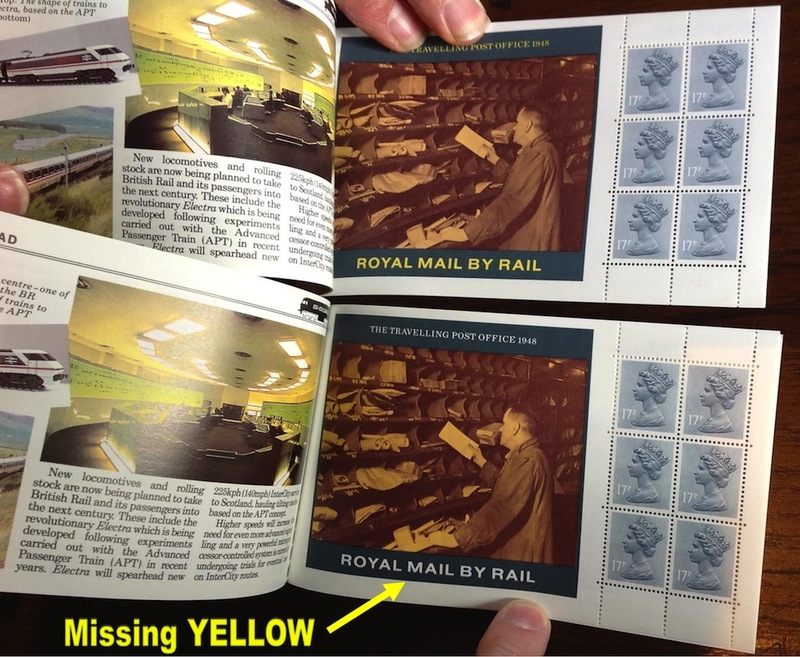 The obvious explanation for the error is that when the stack was knocked up and prepared for stitching, the front cover was damaged - or pre-existing damage or misprinting was noticed. A new front cover sheet was drawn from the reserve pile, and placed on the stack in the wrong orientation! The stack then entered the stitching process, and the stitching duly applied down the left edges of the front cover. The stack was then guillotined and bound, and the individual books packed in 10s. That would have dispersed the errors through several different shrink-wrapped packs. From the top, and to the casual observer, the unopened books would have appeared to be correct. So where are the remainder of the errors ? New Post and Go machines in Sheffield's latest post office. Vince P. reports the opening of another new post office branch with Post and Go machines, this time in Sheffield. Replacing the branch at Co-op premises Castle House, Angel St., Sheffield, S3 8LN, the new branch is located on the rear of the upper floor of Wilkinsons store at 34-36 Haymarket, Sheffield S1 2AX. It will be at a new venue – the Function Room at The Crosswells Inn at Langley. It is very close to the old venue at Rhodia. I'm sure some readers and contributors to these pages are members and I hope some will be there on Sunday. I will be there and I look forward to putting some faces to names. Non-members will also be welcome, and there will be several dealers present. There are many pages only available to members, but a few sample pages are there in the non-members' section to show you what you are missing. 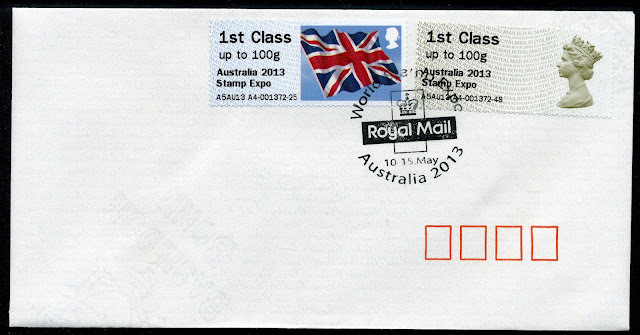 Following on from the special slogans for the Doctor Who stamp issue, we have been told that there is a George Best slogan being used on all UK mail posted to BT addresses in Northern Ireland from 9 to 15 May. As far as I know it is triggered at certain (not sure if all) the intelligent mail processor centres in the UK when a BT postcode is recognised. A picture will be added if anybody in Northern Ireland sends us one! Thanks to John & Patrick we now have confirmation that there were indeed 11 different postmarks in use for all the team members. However, until examples are found, nobody will know whether any of them was actually used and from which sorting offices. As before - please send your images of these if you find any! Thanks to Kevin McShane, Hon Secretary North of Ireland Philatelic Society, Belfast, I can now show some examples of the George Best slogan. 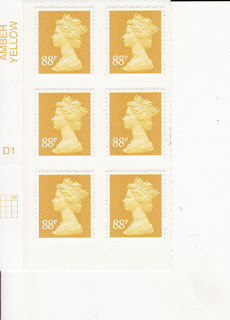 Kevin writes: "About one third of my mail was cancelled with the George Best Slogan with most of the mail arriving with the usual orange coding across the stamp and no slogan. Northern Ireland really only has one main mail centre at Mallusk, Belfast. The Prostrate Cancer slogan was also in use on the 13th. I got a few covers sent from Liverpool to BT1 however these arrived with a standard Warrington Mail Centre cancel and no reference to the football slogan." The machines were supposed to arrive on Monday, but got delayed by Customs. They finally arrived today at 10am (2 hours before the opening). The poor bloke looking after them had only one machine that worked (at least initially) and the other crashed after each transaction (due to internet problems, they chose an unreliable provider here). Anyway, for your edification, attached is a scan of the collector strips from the second machine (A4 - the one that kept crashing). A3 was finally got working and I got a few from it as well. The queue was building and, with a limit of 99 stamps in one transaction, I felt a little bad trying to monopolise slow and troublesome machines. It is because of the uncertainty that I have been unable to say whether we will have any supplies for other than regular customers. It does seem likely that we will have supplies from both machines but at this stage we don't know what the price will be because the costs are not finalised. Chris has sent a picture of the Machin strip received from Tallents House together with the receipt. 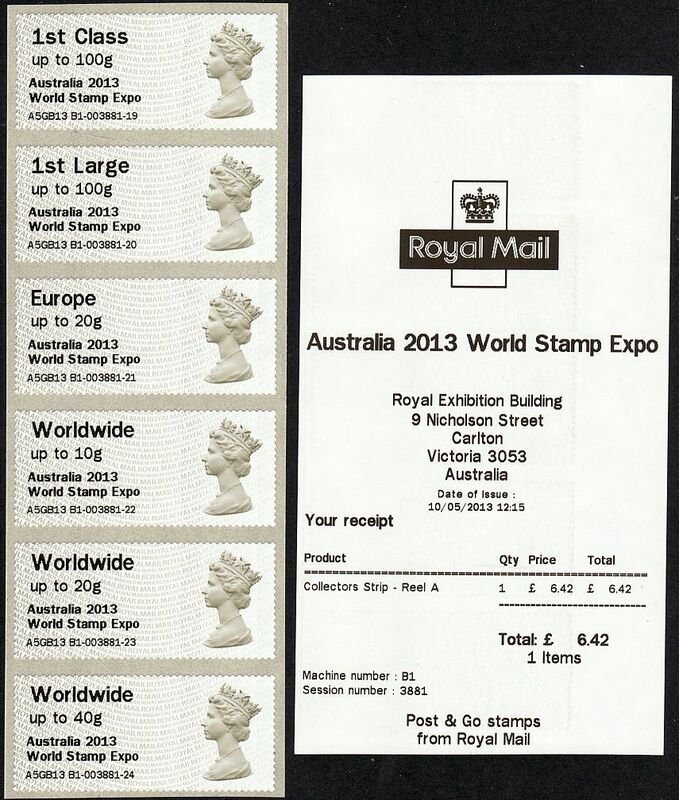 I imagine that this is an accurate facsimile of the ones issued in Australia, but it is quite misleading suggesting that the receipt was produced at the Exhibition Building in Carlton, Vic. And the overprint from Edinburgh doesn't include the word World that the Edinburgh overprint does (thanks for the report 'Anonymous'). What a blunder! 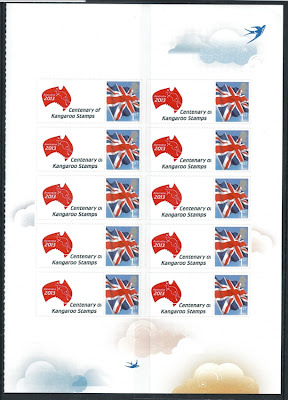 The cheapest way to have an obviously local product is to have a joined pair of 1st class stamps - disappointingly Edinburgh only produced collectors strips of 6. Collectors could be forgiven for giving this all a wide berth! Some misalignment occurred in printing some sheets, resulting in the partial omission of the 'f' in the word 'of' on the labels. 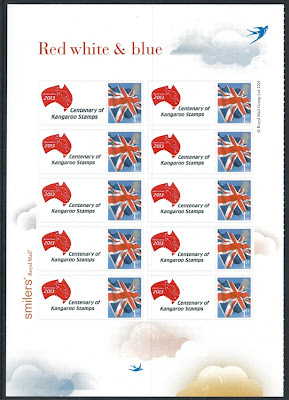 The grey vertical band at the centre of the images is where the clear plastic of the carrier overlaps. Thanks to Alec W and his contact for providing pictures of Australia 2013 covers with the Faststamps affixed, and a pseudo-postmark or cachet.